Whether you exist or not or better still, if you want to tell the world (here we specifically mean the entertainment industry), then all you need to do is doll-up a little bit, borrow a designer garment (buy one, this probability is two in a hundred) and walk down to the special screening, the premiere of any XYZ movie! And if you are seen there, god behold… you matter! Accepting time as the biggest game-changer doesn’t come easy to one and all. It is a fact that no one can question or surpass, at the same time moving along with it requires that something extra… “Acceptability’, Sheeba, the pretty Sheeba completes the sentence. Passion, they say, is the fountainhead of creativity, but when talent thirsts for expression, it preys for innovation in the most unusual realms of creative mediums. At Art Portfolio, Chandigarh, Atul Bakshi talks about exploring a medium that quenched his thirst for both creativity and passion. He is perhaps the only glass sculptor in India and this is the first time that he visits the city. Call her 'Nirbhaya' or gudiya; the names may change but the hell they go through has been the same - brutally raped and tortured. Be it a twenty-something, who was living her dreams of becoming a physiotherapist and looking after her parents or be it a five-year-old who probably hadn't even begun dreaming.... both have been scarred. There's no better way to pay a tribute to the Bollywood legend, director Yash Chopra than a fashion show with a Bollywood tadka. 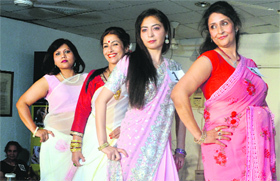 The Women Club Tuesday, while presenting a rhythmic show with music, dance and fashion, added this theme to the glam quotient at their annual event at Central Club, Sector 9, Chandigarh, on Tuesday. When the mangoes flood our markets, we grab them hungrily, only to discover that the golden hued fruit is far from ripe underneath the yellow skin. I finally resort to whipping up a mango shake out of the ones that let you down. 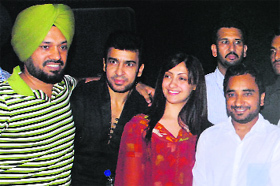 Piccadily square, Chandigarh, which has three state-of-the art screens, recently held Muscle Mania-2013, an event that focused on fitness and strength. The basic objective behind organising the programme was to promote health and fitness amid people of the Tricity.